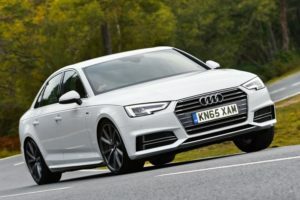 The Audi A4 has been one of those “love it” or “hate it” models for some time, thanks to its conservative body style and rather mundane updates over the years. For 2016, Audi brought the fifth-generation A4 into showrooms, and as expected, it’s more of a facelift than the evolution we hoped for. Highlights of the new-gen model include a more defined grille with sharper points, larger and more aggressive corner air intakes, new layout for the headlight and taillight lenses, and is slightly larger over its predecessor. Inside, the car took on more gracious changes that include a cleaner dash and center stack, standard LED lighting, lightweight seats, a new MMI infotainment system with 4G LTE connectivity, and Audi’s virtual cockpit sitting behind the steering wheel. In the drivetrain department, the A4 got a range of updated engines that range in output from 148 to 268 horsepower. The new Audi Q7 had set a new benchmark for interiors. The same design has flown into the 2017 Audi A4 as well. The air-con vents extend from the centre console to the co-driver’s door. A large screen is placed above and simple AC controls underneath it. There is a gear knob too, which resembles the Q7. The cabin feels plush and spacious. Then there is the MMI system with its bells and whistles. The quality is at par with other Audi products.